With the fabled Squaw Valley ski area, the site of the 1960 Winter Olympics in the background, the Links at Squaw Creek sit in mountain splendor. It’s been nearly 15 years since I’ve last spent time at The Resort at Squaw Creek, where the dark tinted glass on the large windows of its rooms present soaring views of six surrounding Sierra peaks, venerable Ponderosa pine forests and the lush meadow in which the Resort’s golf course sits, and through which its eponymous stream flows. Each room is furnished with richly textured fabrics in muted colors that speak of the mountainous setting. The giant boulders in the entry lobby remain impressive, and the exceptionally maintained property does not look as if it aged a day. And that’s remarkable, given that the Resort is a year-round destination that serves the Squaw Valley Ski area in the winter, with downhill skiing and snowboarding, cross-country skiing, sledding, snowshoeing and snowmobiling, all of which means a lot of dirty and wet stuff gets tracked back onto the Resort’s floors. In summer guests can use the many hundreds of hiking trails around the ski area and nearby Lake Tahoe, cycle miles of paved and ragged trails, and fish crystal clear mountain lakes and streams, which has its own share of wear and tear. But the latter is also the season where Squaw Creek’s golf course emerges from snow, and over the sun-bathed months becomes increasingly playable. It is also one of nation’s more unusual courses, sitting in the middle of a protected habitat. Designed in the early to mid-1990s by Robert Trent Jones Jr. and one of his top assistants at the time, Kyle Phillips, The Links at Squaw Creek required nearly a decade to come into being, a par 71 layout that can play at up to 6,931 yards. 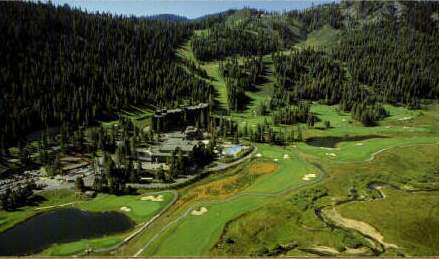 An aerial view of the Resort at Squaw Creek, with its dark-colored lodging building in the upper left of the photo. Although nearly all of this valley served as a parking lot during the 1960 Winter Olympics, environmentalists and California regulators were determined to see that past transgression rectified, and the natural wetlands and wildlife habitat restored. Elevated wood-planked cart-paths and restrictions on looking for lost balls keep the vegetation on either side of narrow fairways protected. As an Audubon International Cooperative Sanctuary member, Squaw Creek also uses the most ecologically sound maintenance practices to ensure a safe haven for plants and wildlife. The maintenance staff uses no pesticides or herbicides, and only a minimal amount of organic-based fertilizer is applied to fairways and greens. In early June, large growths of dandelions crowd the edges of fairways and encroach toward the greens, while grasses in the putting surfaces struggle to grow. Without the tools normally available to most course superintendents, the factors are simply, frankly and even graciously accepted, because that’s the nature of what in fact is a rather special course. 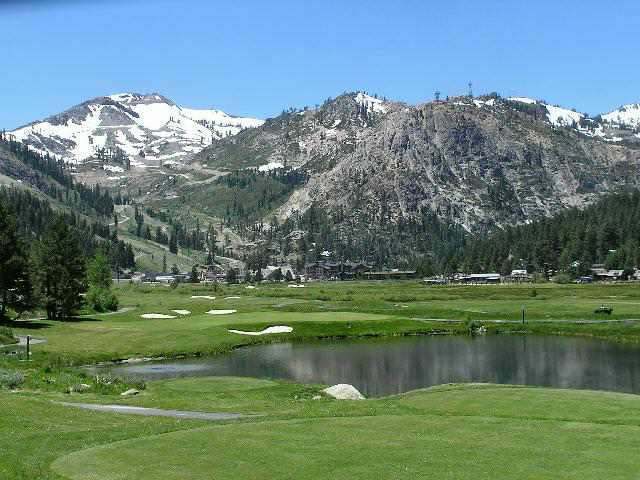 However, if a golfer simply accepts these conditions for what they are, The Links at Squaw is an incredibly cool course, in a valley surrounded by some of the best ski slopes in North America, bisected by one of the most beautiful creeks in the Sierra. And the rates are as kind to the eyes as the views, topping out at $99 for public non-guests, $79 for those staying at the Resort, with good discounts for afternoon and twilight play. Along with comfortable rooms and an interesting golf course, The Resort at Squaw Creek also has its share of good food, at small emporiums in its shopping areas and at its major restaurants. For example, an excellent way to start the morning here is with a leisurely breakfast or brunch at Cascades, a family-friendly restaurant that offers a fabulous buffet and pairs gourmet food with a casual California-style atmosphere. Many if not most of the ingredients in its dishes are locally sourced, including eggs from Lake Tahoe, jams and jellies from Yuba City, and sausage from Carson City, just down the mountain in Nevada. For dinner the Resort’s Six Peaks Grille also uses regional ingredients, from sustainable seafood to meats and produce from greater Northern California. The floor to ceiling widows offers spectacular views of, well, the Six Peaks and Squaw Creek. Set on 195 hillside acres, the Resort at Squaw Creek is only a 15 minute drive from Truckee and about five miles from Lake Tahoe. And after all these years it remains one of the best stay-and-play properties in the region.